Welcome. I don't recall that boat. But I recall the yacht "Crystal Lady" that was built by Warren. New member here,, im from the Michigan / Lake Saint Clair area and have a few questions.. Looking at all these awesome old pictures really brought back a lot of memories. There was a local race team that i can barely remember, it was a father and daughter and i think the boat was called Crystal Lady ? Going off a bad memory but i think they owned a business called Arrow Pattern in Warren Michigan. Does anyone recall that boat?? Thanks.. I can't find anything out about it. Maybe one of the older guys?? I tried. I went as far as trying to trace existing pattern companies back to Arrow. No luck. The ladys name is Kristyl Girschner and this is the boat i was looking for. The Blue cat i remember seeing was the Miss Doc/ Blue Max. Well, now that we have the spelling known, we can dig some stuff up. It appears as if there were 2 Kristyl Lady's. One a Magnum, the other not sure yet but digging. Hey i was close on the spelling LOL,,, Nice pics !!!! So they were both Magnum's? You're from that neck of the woods, do you recall them? Same Registration Numbers in both pics. you expect Paul to see that? You can swap registration numbers from boat to boat in Michigan. Just like license plates. You think it's the same boat with extensive modifications to the hatches, handrails, and bow handrail? Was it unusual to see Volvo Penta drives on a race boat back then?? I thought MerCruiser had the market cornered. I would say not unusual for production like classes. Mercruisers with trannies, TRS and speedies were heavier and more expensive. The number one drives like the present alpha did not have counter rotation. Volvo had the only counter rotating drive that did not need a trannie. Volvo's cone clutch patent expired in 86 or 7 . That is when Mercruiser released the Bravo drive. who wants a 2019 calendar ? email me c12lamorte @ aol.com or paypal me to that email. 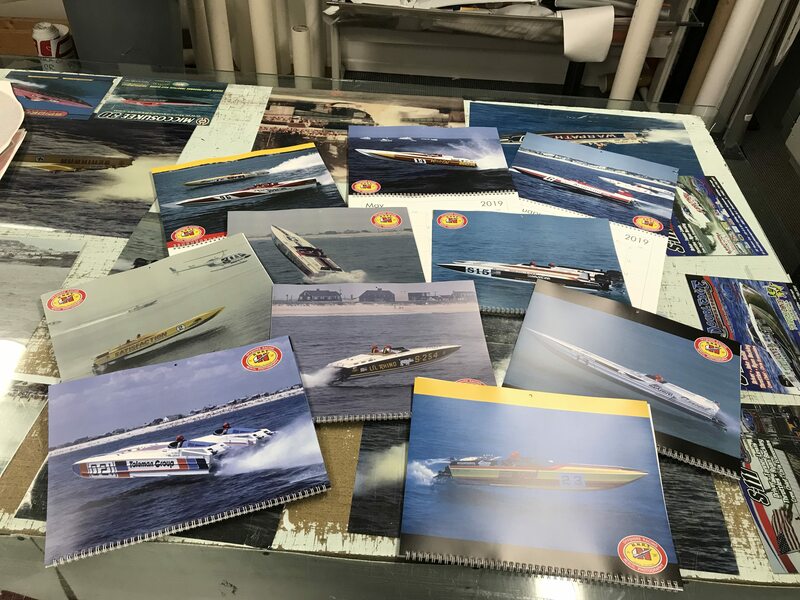 11.5x14.5 wall calendars $30.00 each delivered within the US. Not sure how I missed this. Just took down last years new a few new ones.